How tree morphology develops in mixed-species stands is essential for understanding and modelling mixed-stand dynamics. However, research so far focused on the morphological variation between tree species and neglected the variation within a species depending on intra- and interspecific competition. Our study, in contrast, addresses crown properties of nine mature Norway spruces (Picea abies [L.] Karst.) of a pure stand and compares them with ten spruces growing in mixture with European beech (Fagus sylvatica [L.]). The same was done with 11 pure stand beeches and 12 beeches growing in mixture with spruce. Through application of a terrestrial laser scanner and a new skeletonization approach, we deal with both species’-specific morphological traits such as branch angle, branch length, branch bending, crown volume and space occupation of branches within the crown, some of which were hardly accessible so far. Special attention is paid to distinct differences between trees growing in mixed and pure stands: for spruce, our study reveals significantly longer branches and greater crown volumes in the mixed stand when compared to the pure stand. In case of European beech, individuals growing in mixture show flatter branch angles, more distinct ramification, greater crown volumes and a lower share of a single branch’s space occupation in the total crown volume. The results show that the presented methods yield detailed information on the morphological traits analyzed in this study and that interspecific competition on its own may have a significant impact on crown structures. 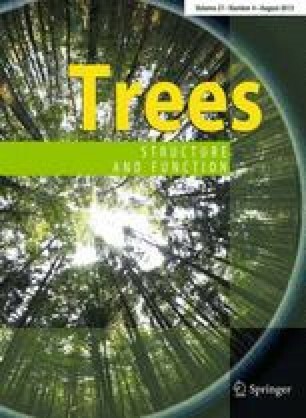 Implications for production ecology and stand dynamics of mixed-species forests are discussed. We thank the Bavarian State Ministry for Nutrition, Agriculture and Forestry for permanent support of the project W 07 “Long-term experimental plots for forest growth and yield research” (# 781-20400-2012). Thanks are also due to Dr. Peter Biber for advice on the statistical analysis, Gerhard Schütze for participating in the field work and assistance in the data preparation, Ottilie Arz for assistance in field work, the skeletonization work as well as artwork creation in the course of her master thesis and reviewers for their constructive criticism.